On the Charms bar, click Settings > Network icon at the lower-right corner of your Desktop screen. NOTE: Depending on whether the computer you’re using is wired or wirelessly connected to your router, you may see either the LAN or the Wi-Fi icon. 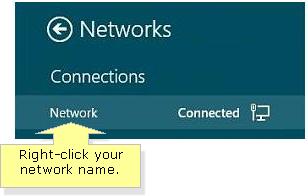 In the Networks section on the right navigation pane, right-click your network name. Click Turn sharing on or off. If you want to change the Network type from Public to Private, click Yes, turn on sharing and connect to devices. 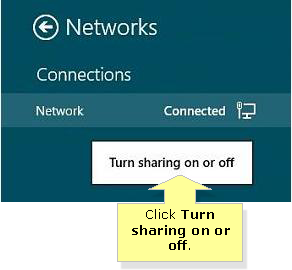 To change the Network type from Private to Public, click No, don’t turn on sharing or connect to devices. On the Charms bar, click Settings > Change PC settings > Network. 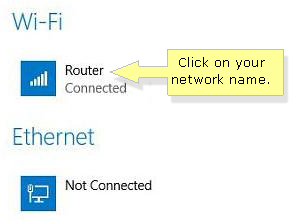 Click on your network name in the right pane. 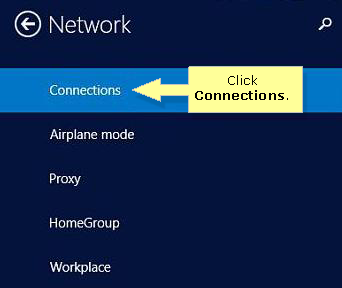 In the Find devices and content window, toggle the Find PCs, devices and content on this network and automatically connect to devices like printers and TV’s to On if you want to change the Network type from Public to Private. If you want to change it from Private to Public, toggle the button to Off. You should have successfully changed your computer’s Network type now.